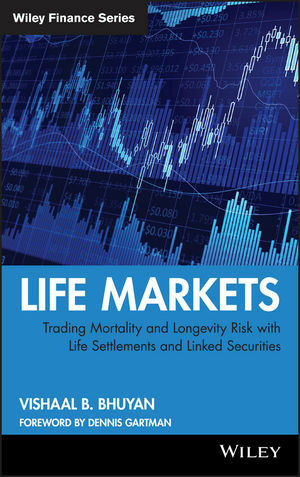 Covering everything from the history of life settlements to making a transaction-pricing, service providers, exchanges, and more-this book contains extensive coverage of the many issues surrounding longevity finance. VISHAAL B. BHUYAN is the Managing Partner of VB Bhuyan & Co., an advisory firm focused on educating institutional investors on the life markets. As an advisor, Bhuyan assists institutional investors on building profitable trading strategies that utilize a number of mortality and longevity risk related products. In addition to delivering presentations, Bhuyan has been featured, or published in, a number of widely read financial and economic publications and publishes the Wave Report, a monthly market commentary on the life markets. Bhuyan is a graduate of the University of Pennsylvania. Part One: Life Settlement Basics. Chapter 1: A Brief History of Life Settlements (Vishaal B. Bhuyan). Chapter 2: Features of Life Insurance (Vishaal B. Bhuyan). Chapter 3: What is a Life Settlement (Dr. David Blake and Debbie Harrison). Chapter 4: Parties Involved (Vishaal B. Bhuyan). Chapter 5: Other Involved Parties (Vishaal B. Bhuyan). Chapter 6: Underwriting (Michael Fasano). Chapter 7: Life Insurance Policy Swaps (Vishaal B. Bhuyan). Chapter 8: Premium Financing (Vishaal B. Bhuyan). Chapter 9: Life Settlement Securitization (Emanuel Modu). Part Three: Analytics and Pricing. Chapter 10: Life Settlement Pricing (I. James Cavoli). Chapter 11: Using Life Extension-Duration and Life Extension-Convexity to Value Senior Life Settlement Contracts (Charles A. Stone and Anne Zissu). Chapter 12: Real Options Approach to Life Settlement Valuation (Joseph R. Mason and Hal J. Singer). Chapter 13: Risks Associated with Life Settlements (Nemo Perera). Chapter 14: The Risks of a Securitized Portfolio of Senior Life Settlement (Charles A. Stone and Anne Zissu ). Chapter 15: Synthetics (Antony R. Mott). Chapter 16: Life Settlements (Boris Ziser and Joseph Selvidio). Chapter 17: Regulatory Issues & Insurance Company Reaction (George J. Keiser). Chapter 18: Tax Implications (Micah W. Bloomfield). Chapter 19: The Ethics of Profiting From Mortality (David Blake and Debbie Harrison).